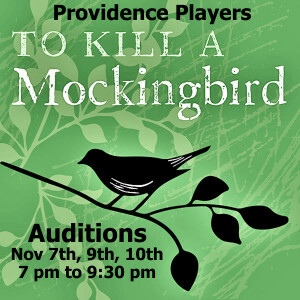 The Providence Players will hold auditions for their upcoming production of Christopher Sergel’s play To Kill a Mockingbird, based on Harper Lee’s Pulitzer prize-winning novel, on Mon, Nov 7th, Wed, Nov. 9th & Thurs, Nov 10th from 7:00 – 9:30 pm the James Lee Community Center at 2855 Annandale Rd Falls Church. Call Backs (if needed) Mon Nov 14th 7:00 – 9:30 pm. The production will be directed by Beth Gilles-Whitehead. There are 18 Speaking roles – 9 men, 2 boys, 6 women, 1 girl, as well as 3-4 gospel singers and extras in the crowd of the trial. All roles are open. Please RSVP your intentions to audition to the email below. PLEASE RSVP to Director Beth Whitehead at thewhiteheads@cox.net with the date(s) you plan on auditioning. HOW WE WORK: You are welcome to come to auditions on more than one of the initial audition evenings. This is not a requirement. Most PPF auditions have actors up and down to read multiple times in multiple combinations and scenes. Most actors find this fun. As space allows, you will be able to watch all the auditions. You may be asked to go into the hallway with audition partners and work a bit on a scene. We will do our best to get you up multiple times reading for parts you are interested in. You will also be asked to read for other parts you may not be auditioning for. 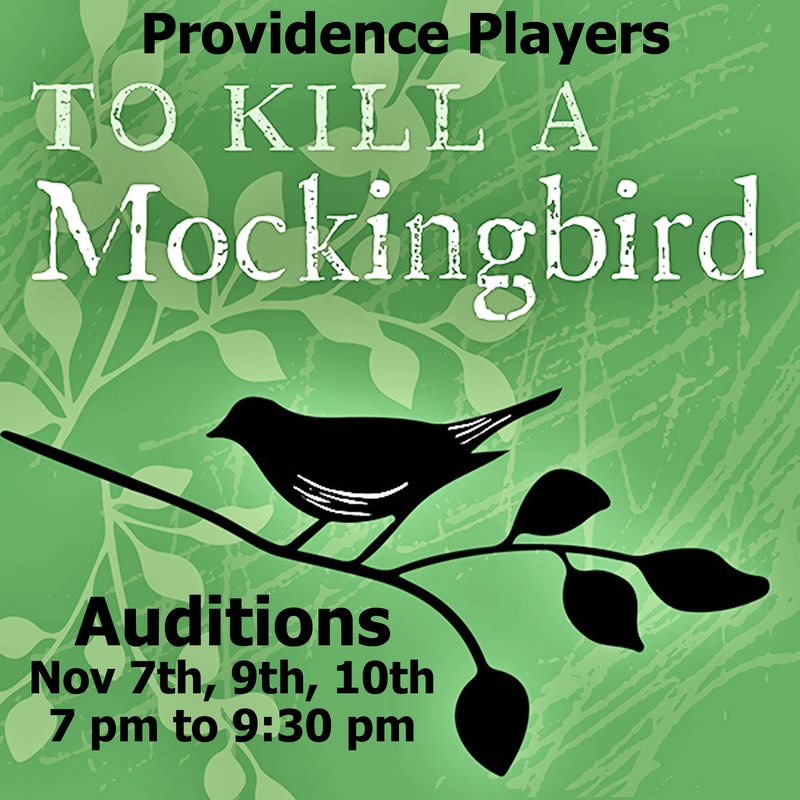 The Providence Players strives to make our productions open to interested and engaged actors & actresses, regardless of their level of experience. We try and make our auditions as relaxing and fun as possible. AUDITION PROCESS: Auditions will consist of cold readings from the script – No monologue required. AUDITION FORM: Resumes and head shots will be accepted, but are not required. Please ALSO COMPLETE the attached PPF To Kill a Mockingbird Audition Form and bring it with you to the audition. A copy of the preliminary production schedule is included with this announcement and will be available online and at auditions. Stage rehearsals begin February 21, 2017. In addition to the stage rehearsal schedule, additional full cast readings of the play and selected scene study and character work will be scheduled by the director after casting. To Kill a Mockingbird takes place during a hungry hurting time in America. It is 1935 in Maycomb, Alabama. Most people know the story of Tom Robinson and his trial for a crime he did not commit. The heroic efforts of Atticus Finch to defend Tom in a town that mostly see just black and white and the divide between them. The deep seeded prejudice, hatred and mistrust as well as the desperate folks just trying to survive. Family, hope, truth and compassion is everything. This is a love story of Scout, her dad, her brother and her search for her place in the world. It is a story that reminds us of how important integrity is in each one of our lives and how we all can try and be more like Atticus Finch. Our production will reflect the difficult times the people live in, the circumstances that affect their decisions and the love that is trying to push its way to the top of hatred, bigotry and lies. It’s a love story! The Director is casting in November so all can learn their lines before rehearsals begins. Jean Louise Finch (Scout) girl age 7-11 (Very verbal, strong willed and curious) Has a lot of lines. Must have stage presence and lots of confidence. Mayella Ewell 19 year old girl. Strong gal who’s been abused, beaten and lives in poverty. Has no friends and is probably always hungry and lonely. Atticus Finch age 45-60. Dad, lawyer, man of high integrity, very humble and full of patience. Sheriff Heck Tate could be 35-65. Good honest man doing his job. Reverend Sykes any age, African American spiritual leader. Bob Ewell age 40-55. Dirty, mean and as unloving as a man can be. Full of anger, resentment and spite. Walter Cunningham a farmer age 40-55. Honest farmer trying to make his way, turned by opinion easily. Mr. Gilmer age 30-45. New lawyer trying his case and wants to win. Tom Robinson African American age 25-40. Honest father and hard worker caught in a terrible lie and trying to survive. Calpurnia African American house keeper and family friend to the Finches age 35-65. Hard worker, caring, motherly and takes no guff from anyone. Maudie Atkinson 40-65. Kind, loving neighbor who answers questions and has been a mother role to the Finch children. Loves gardening and finding the good in people. Stephanie Crawford age ? gossipy neighbor who lives for a story to repeat and embellish and repeat. Loves to hear her own voice. Mrs. Dubose very cranky and very old. Sick old woman who takes her misery out on the neighbors and young people. 3 or 4 Gospel singers, African American women and/or men.